By Brooke Anderson, In These Times. 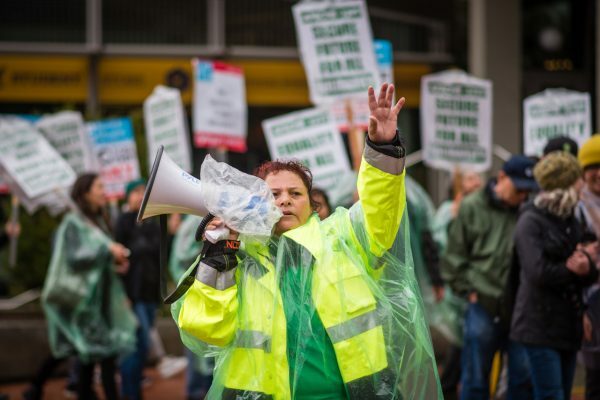 Thanks to thousands of solidarity strikers, this was the largest strike of 2019. NEARLY 40,000 WORKERS AT THE UNIVERSITY OF CALIFORNIA (UC) WENT OUT ON A 24-HOUR STRIKE MARCH 20. 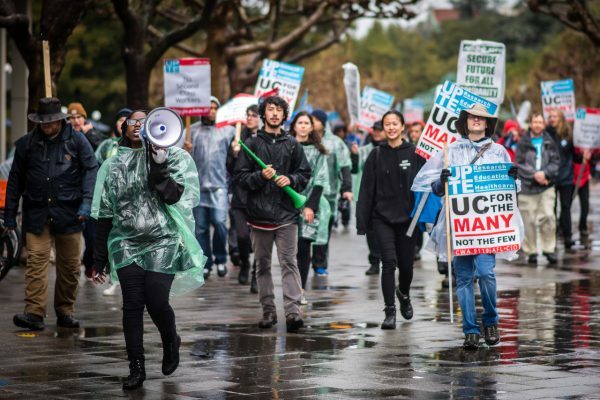 California – The strike, which took place at all 10 campuses and 5 medical centers affiliated with the UC system, is the largest strike of 2019 to date, thanks to the significant number of solidarity strikers. The strike was called by the University Professional and Technical Employees (UPTE), CWA 9119, which represents 10,000 research and technical workers. 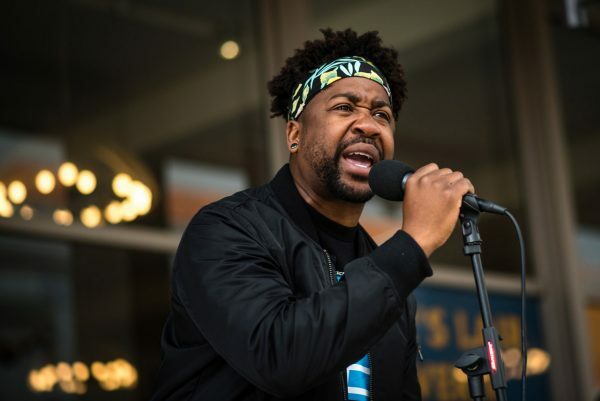 Joining them in a solidarity strike were 5,000 health care workers also represented by UPTE, as well as 27,000 patient care and service workers represented by UC’s largest union, AFSCME 3299. All three groups of workers are currently working without a contract. Both unions have been in negotiations with UC for 22 months. 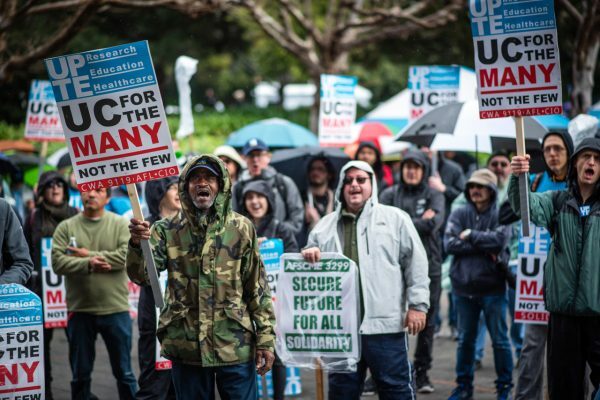 On the UC-Berkeley campus Wednesday, hundreds of striking cooks, custodians, gardeners, stage hands, social workers, lab techs and other workers picketed, often in pouring rain, in front of the university’s main entrance. Like thousands of other striking educational workers this year, the UC workers’ strike raised concerns about how the privatization of education and the outsourcing of jobs drives deep race, class and gender inequalities for educational workers and the students, patients and communities they serve. “The university is increasingly relying on those workers so they can use the money they save to reward those at the top. These workers—much like our members—are immigrants, people of color, and black and brown women who are the anchor in their family. When they are exploited, it exploits the entire community,” continued Perlman. In 2017, the California State Auditor found that the UC Office of the President was paying exorbitant salaries to top-level executives and had failed to disclose $175 million in budgetary reserves, trashed by many in the media as a secret slush fund for administrators’ pet projects. At the the time of the report, UC had proposed a 3 percent hike in student tuition and was increasingly outsourcing once-career pathway jobs to private corporations that pay workers less. Multiple calls to the UC public affairs office for comment were not returned by the time this was published. Vermont Senator and 2020 presidential hopeful Bernie Sanders spoke in support of striking workers at the UC-Los Angeles campus on Wednesday. Workers were expected back at work today. 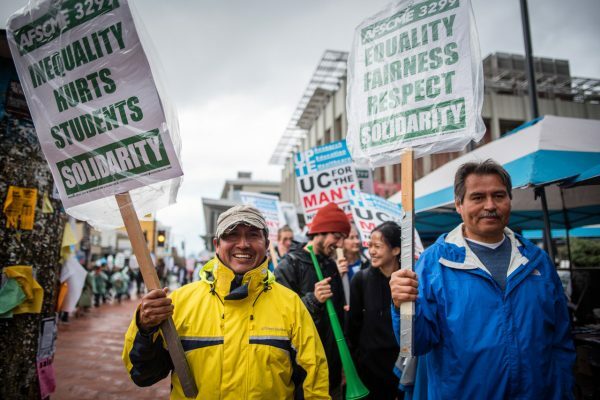 Here are some of the faces and voices of union members and their allies on the picket line at the UC Berkeley campus yesterday. Tony Smith, an animal technician in cancer research at the Lawrence Berkeley National Laboratory at UC Berkeley, reacts to speeches at a noontime rally on campus. Smith has worked at the University for 24 years and is a member of UPTE. 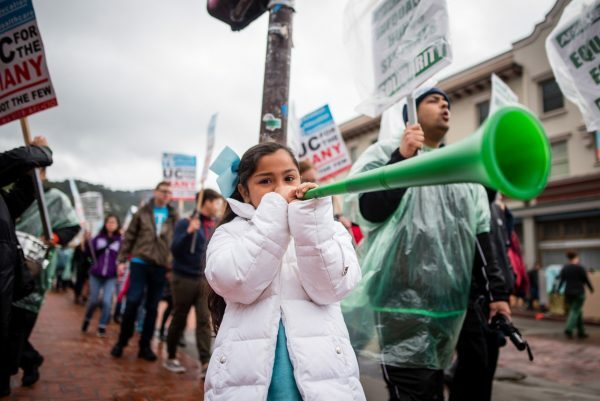 Crystal Bruno, 7, blows a horn while walking a noontime picket line on Wednesday. 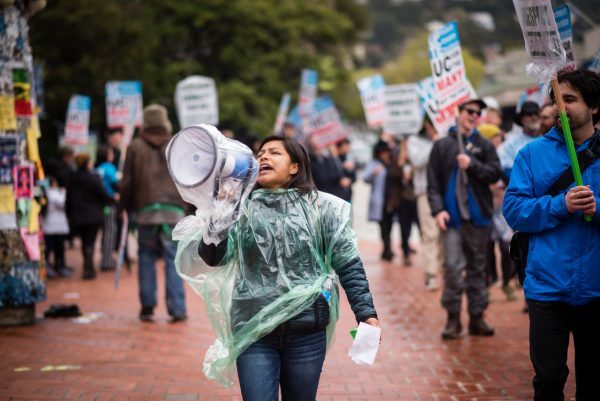 Her mother, Ignacia Bruno, is a custodian at UC Berkeley and a member of AFSCME 3299. Many workers named their desire for their children to have a better life as one of the reasons they were out on strike yesterday. 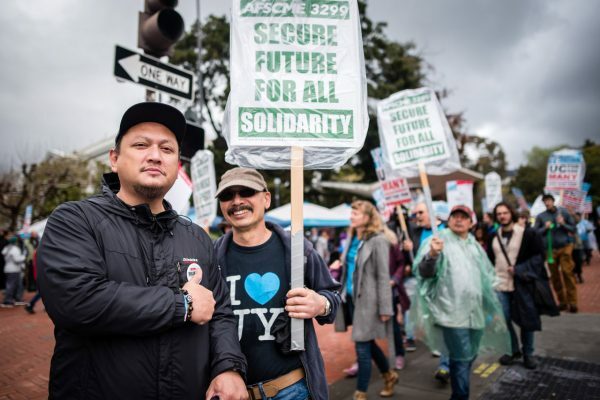 Andre Alvarez and Peter Javier, both of whom work as cooks at UC Berkeley and are members of AFSCME 3299, picket at the main entrance to the UC Berkeley campus on Wednesday. 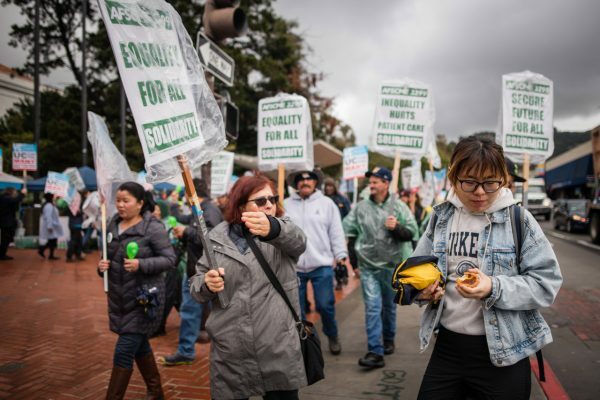 Strikers on the picket line attempted to turn both students and workers away from entering the UC Berkeley campus, asking them to support the workers’ struggle and honor the picket line. Celia Santillan (left) and Antonia Sanchez (right), both members of AFSCME 3299, feed fellow union members on the picket line on Wednesday. “We have three types of tamales: beef, vegetable, and poblano pepper with cheese. We’ve also got pan dulce (sweet bread), coffee, and yogurt with granola. 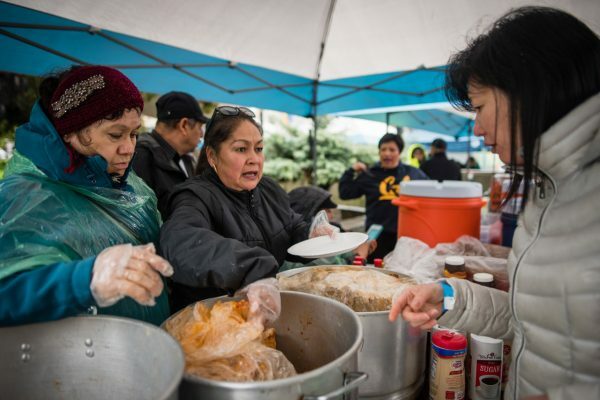 It’s important to keep people warm on the picket line,” said Sanchez. For full disclosure, the author is a member of another affiliate of the same national union—Communication Workers of America—of which UPTE is also affiliated. These connections among all types of workers is encouraging. It is the only way that the working class can take it’s power and resist being starved out by the management actions of all sorts of employers. Exciting to know of our strength and solidarity. Keep us informed. Workers united can paralyze capitalist institutions. By George! I think they’ve got it!